Brrr, its cold out here, and when Piranis are cold, they crave SOUP! Hot soups becomes a norm at home, but Ummi will set aside the ladle for Little China's Special Hot and Sour soup. So the kitchen was closed for the night. Unfortunately, the younger Piranis believe Eating Out = French Fries, not an item on the Chinese Menu. But this time, Subhan'Allah, as the Pirani palate desired to experiment with something exotic, hence the above dish, which visually satisfied the lil ones (pure coincidence, we had no idea what it would look like) and after eating it the final verdict was "its good, tastes like prawn". 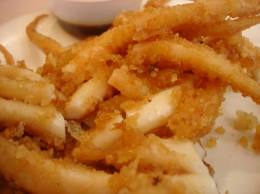 The pic is a plate of chewy, tasty, fried SQUID!